Reintroductions, translocations, and augmentations are methods of restoring or increasing wildlife populations. These actions require a lot of planning and are often expensive. These methods involve removing animals from a source population and placing them in another location. The goal of these efforts are usually to establish a sustainable population where one did not previously exist, provide new individuals to a site with a low population in hopes of increasing the population, and providing new or rare genes to a population that may need genetic rescue, among other reasons. 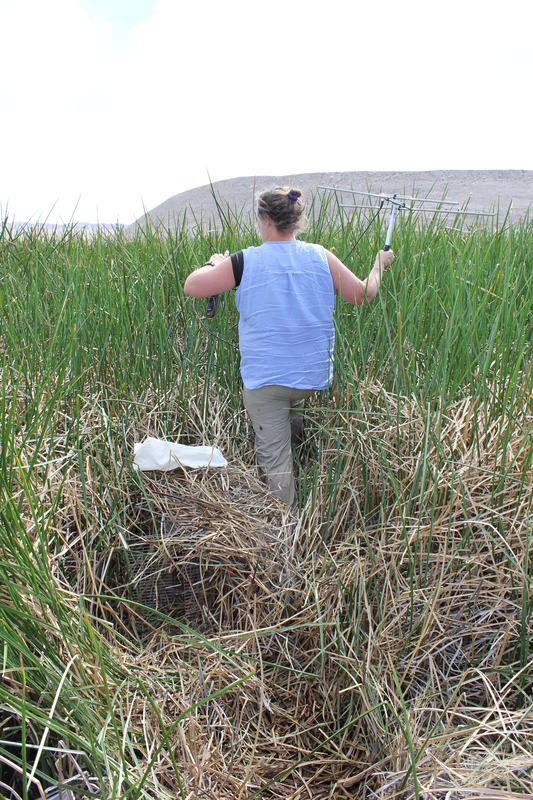 This summer our University of California, Davis and California Department of Fish & Wildlife (WIL) research team conducted a population augmentation for the endangered Amargosa vole (Microtus californicus scirpensis). Our goal was to supplement a very small population of voles in one marsh with new individuals and genes from a larger population in another marsh. A “hard” release of a collared vole at the source site. We placed radio collars on 3 voles at the source site, 4 voles that we removed from the source site and relocated to the recipient site, and 3 individuals at the recipient site. By collaring both relocated voles and resident voles at source site and the recipient site we could monitor how relocated animals utilized the new site and whether or not resident individuals were impacted by the presence of new individuals in their habitat. Janet Foley (UC Davis Co-Principal Investigator) uses and antenna and receiver to listen for the signals of radio- collared Amargosa voles. Photo courtesy of Risa Pesapane. The data we collected will greatly benefit vole recovery and inform how we conduct future releases. In addition to the augmentation efforts this summer we also continued to study the population cycles of voles and predators in the area. These studies allow us to better understand how voles and predators use the area how the predators may be affecting vole populations. 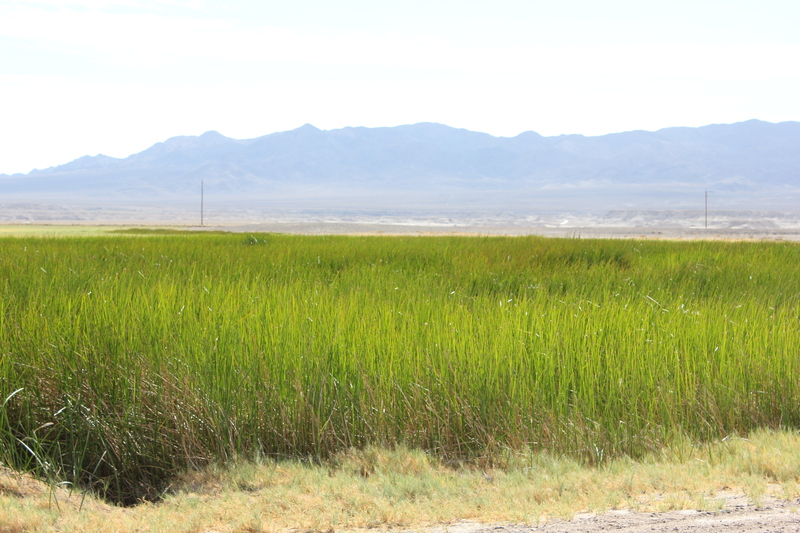 We have also been studying the vegetation and water levels to better understand the needs of the Amargosa vole. These efforts will help us better understand how to restore and improve vole habitat. Stephanie Castle, Risa Pesapane, and Amanda Poulsen (UC Davis Graduate Students) conduct a point count for Amargosa vole predators. The research this summer would not have been possible without the support from our partners at the U.S. Bureau of Land Management, U.S. 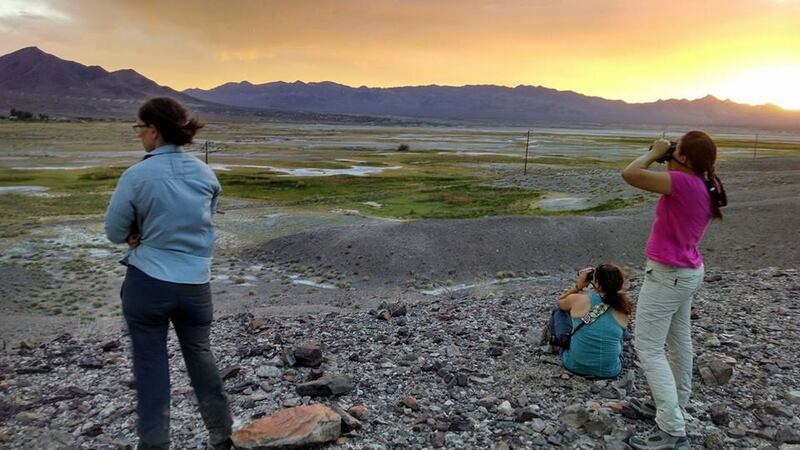 Fish & Wildlife Service, CA Department of Fish & Wildlife (Region 6), Integral Ecology Research Center, U.S. Geological Survey, Shoshone Village, Inyo County Roads Department, and the Amargosa Conservancy. Captive breeding can sometimes be an effective conservation method in the toolbox available to wildlife managers. It’s often employed as a last resort when other conservation efforts have not succeeded. Wild-caught animals are brought into a captive environment and mated for the purpose of increasing the species’ numbers and/or to create an insurance population in case the wild population goes extinct. Captive breeding programs have helped in recovery efforts for several endangered species including the California condor, black-footed ferret, island fox, and peregrine falcon. 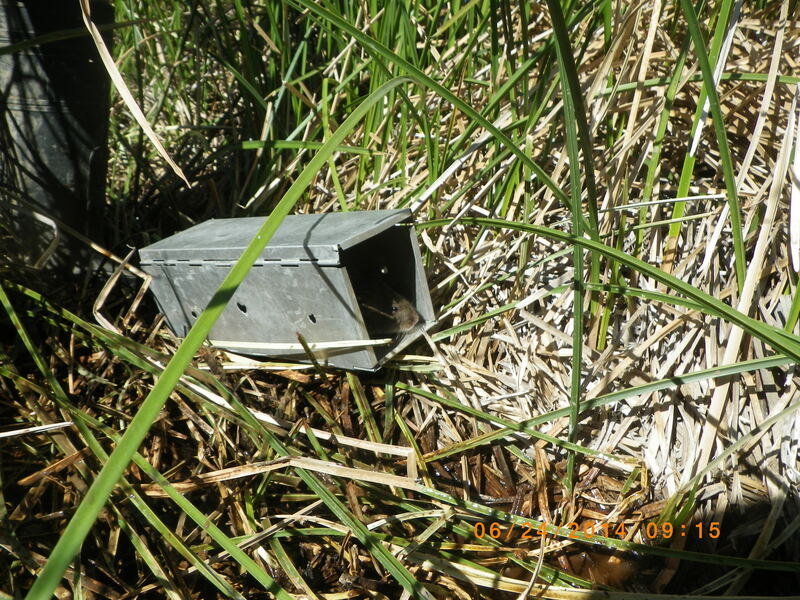 Our research team from CDFW and UC Davis have been monitoring the population of the endangered Amargosa vole (Microtus californicus scirpensis). 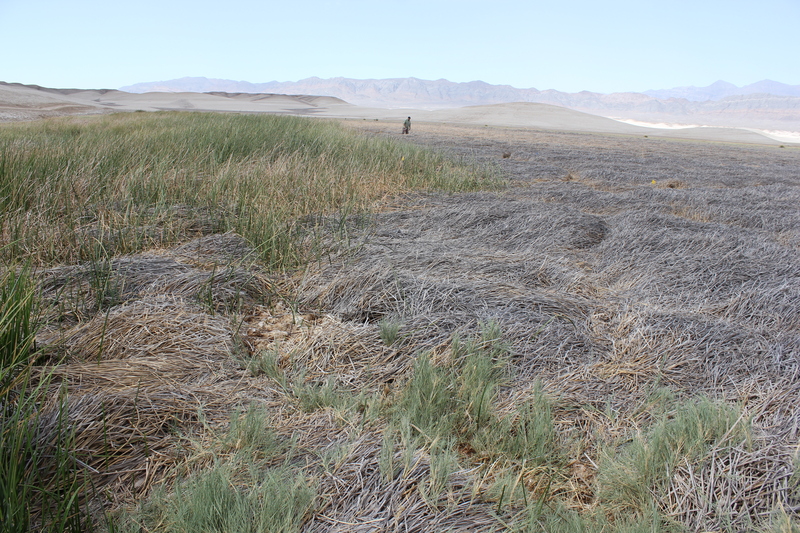 In July, we observed that the habitat of the marsh where most remaining voles live was rapidly degrading. At the same time, vole numbers were rapidly increasing as part of a normal birth pulse cycle. The shrinking marsh was not going to be able to support the number of voles being born so we consulted with our collaborators in the Amargosa vole working group (the US Fish and Wildlife Service, Bureau of Land Management, US Geological Survey, and UC Berkeley) and brought 20 young voles (that would have likely died in the wild) into captivity to try to establish an insurance population of voles. Ten males and 10 females were brought to UC Davis and placed into indoor quarantine in late July 2014. Individuals underwent disease and genetic testing to decide which individuals would be paired for mating. After quarantine, voles were placed into pairs for mating. In October, we successfully weaned our first litter of Amargosa vole pups! This is the first step to expanding the captive population to the point when animals can begin to be released into the wild to supplement the wild population. The voles are currently being housed indoors, but we are in the process of creating outdoor pens for the voles where they will experience conditions more closely resembling their natural marsh environment. While a small step has been made towards the recovery of this endangered species and the path forward remains long, our team remains committed to saving the Amargosa vole.